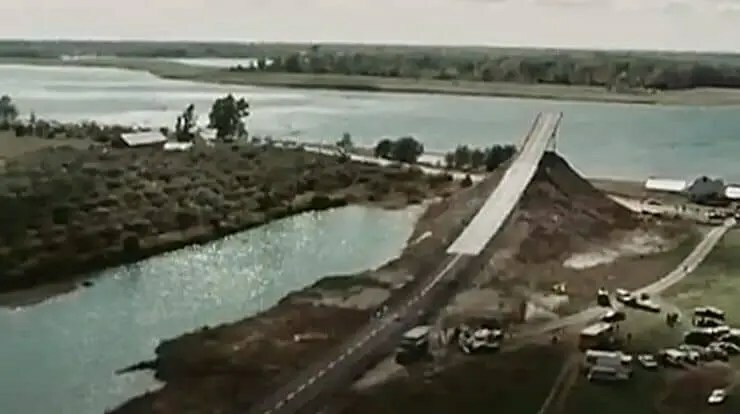 It is 1976, and in Eastern Ontario, alongside the St. Lawrence River a man named Ken Carter (AKA The Mad Canadian) intends to jump the St. Lawrence River in a rocket-powered Lincoln Continental. The event was encircled by hoopla and mired in inevitable delays. Even Evel Knievel said it couldn’t be done. This actual event is the basis for Missy Marston’s new novel, Bad Ideas, published by ECW Press*. Bad Ideas is a great read, a well-balanced mix of pathos and humour. Jules Tremblay (in the role of Ken Carter) is a down and out stunt driver who performs at carnivals and fairs with the Hell Drivers (which I recall seeing as a boy in Kingston, Ontario not far from the actual jump site near Morrisburg, about an hour east of Kingston). The fictional town of Preston Mills is a sad little place, a town that was moved to make way for the construction of the St. Lawrence Seaway in the early 1950s (“this was Preston Mills, the second. Preston Mills, the ugly”). A linen mill is the main employer in town, and two of its employees are Claire and her daughter Trudy. Claire works the day shift and Trudy the night shift so they can care for four-year-old Mercy, the daughter of Trudy’s sister Tammy, who has left town and disappeared. They eke out an existence, living in a small tar-paper shack that Trudy’s grandparents rent to them. If all of this sounds depressing, it is. Claire is not happy because she pines for Darren, the father of Trudy and Tammy, a married man who left Claire and the girls when they were both young and went back to his wife (and life) in New Brunswick after his work on the canal was finished. Trudy is not happy for she is twenty-two, with no boyfriend, stuck working the night shift and is more of a mother to Mercy than anything. Their lives are full of the consequences of their “bad ideas,” it seems. Then Jules walks into Trudy’s life and she is hooked. Getting involved with Jules is a bad idea, too, but one that Trudy cannot get beyond. Jules is a lovable loser. So is Trudy. They need to be together, although Trudy does not want Jules to go through with the jump, which is all Jules can think about for the moment, although the whole thing is going south very fast. Poor construction of the ramp, rocket car problems, sponsorship and TV deals falling through and debts mounting up. A bad idea, indeed. Bad Ideas is not so much about “the jump” (although it is the carrot on a stick that keeps you in a state of anticipation) as it is about Jules and Trudy and Trudy’s family along with the day-to-day grind of working towards some semblance of a dream, whatever that might be. Trudy, who left high school to work can certainly hold down a menial job, but she is tormented (bullied, actually) by her co-workers for their perception that she is better than them for some imagined reason. At the end of her shift, as Trudy was punching out, Jeannie appeared beside her. There it was. You think you’re good, don’t you, Trudy? While on the whole, Bad Ideas is a humorous read, but it has it’s serious side too, particularly as Trudy is annoyed at the idea of losing Jules just when she has discovered love. “You better believe I can do it.” Jules seemed startled, not quite angry. He pushed himself up on his elbow to look at her. Trudy knew what he was thinking. Now this. The stupid ramp, the stupid car. Another delay. The constant threat of losing his TV deal. And now, this. Then, out of nowhere, these words came out of Trudy on a wave of salty, bitter tears. And they come out loudly. Poor Trudy. While she has made some bad decisions in the past, we the reader can readily root for her now that Jules has appeared, bringing some hope along with him. Yet “the jump” looms over everything, much like the gigantic, crumbling ramp looms over the St. Lawrence River. Bad Ideas is a great read, a well-balanced mix of pathos and humour that I rated as four stars at Goodreads. The way Ms. Marston brings all the threads of each character’s past into the present is a marvel of writing that makes Bad Ideas well worth reading. Put it on your Summer Reading List. Recommended. *This review of Bad Ideas is based on a reading of an Advance Reading Copy supplied by ECW Press in exchange for a review. Quoted passages may differ from the final published edition. Bad Ideas will be available April 23rd. You may pre-order the print or Kindle edition below. Please note if you choose to purchase this book through Amazon using these links I will receive a small commission at no extra cost to you. If you cannot see the Amazon ad below (if you are using an ad blocker, for instance) here is the link: https://amzn.to/2KDpnrU Thanks! It actually is! It made me look up the story behind the story, which in the pre-internet days went pretty well unnoticed and died a quick death.